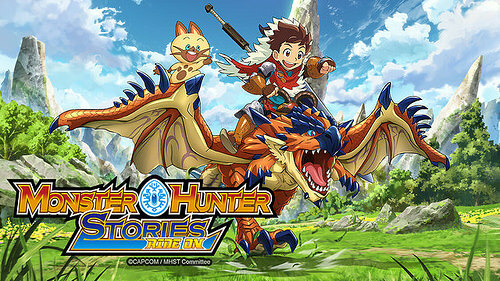 It’s time to look at Monster Hunter. An anime that may be different than what you’re expecting as it is based on a very specific game in the series that is about riders instead of hunters. The series never really manages to break out of its shell and become something too epic which is a shame. There are certainly some more interesting things they could have done here and it could have potentially opened up into something like Pokemon. Still, it’s a reasonably good show and one that lasted for a long time so the show had time for a lot of things to happen. There are two main arcs, but lets say 3 since the pre arc was rather long. The start of the show is about Lute, Cheval, and Lilia as they journey throughout the village and into towns as they learn more about being Riders. Unlike Hunters who destroy monsters for rewards and safety, Lute and the gang grew up in a village where they live as pals. Lute aims to prove that having kinship with a monster is the right thing to do while the hunters aren’t very sure. Hijinx ensues and the cast often have to wonder if this is the right call. Even if it is, how will they convince anyone to change sides? To become a rider you have to get a special jewel and to do that you basically have to join a village so that’s a tough sell for anyone. The next arc is the darkest of the show as Cheval’s life is forever changed when a blighted monster destroys the village. He decides to avenge his family by hunting down and destroying all blighted monsters. Lute doesn’t think that this is the way to go though and decides to purify all of the crystals instead to stop the corruption at its core. The two of them become enemies now and while Lute is convinced that they can still be friends with differing opinions, Cheval doesn’t agree. He aims to destroy Lute once and for all to prove that sometimes Kinship isn’t enough to keep two people together. Finally, the series brings in a new group of villains known as the Black/Ebon/Dark Riders who show up and kidnap Avinia. They aim to bring the world to its knees by performing a forbidden ritual and getting unlimited power. Lute and Cheval have to try and stop these guys, but the problem is that they are outnumbered and these villains are also way too powerful. They will need some kind of power up to hold their own. The other villagers realize that they will have to get stronger as well, but can they bridge the gap in time? The show’s tone was all over the place, but for the most part it was rather light. Think of it as a classic slice of life series for a while as the heroes head to various towns and chat with people. That’s why in some cases the episodes could get a little boring since the cast isn’t amazing. 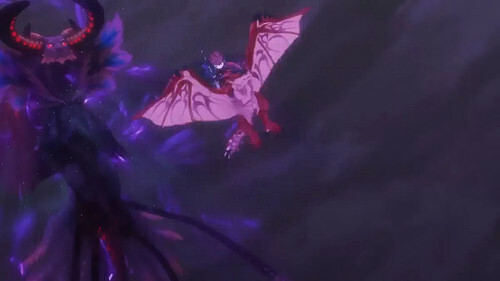 Then the show gets really dark for the main Blighted Monsters arc. 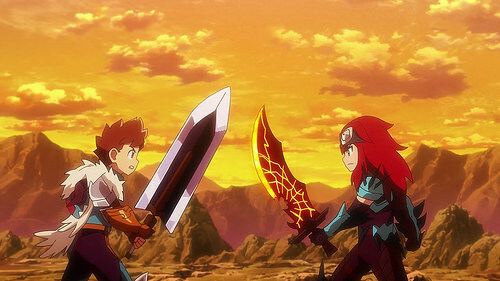 One thing the show is rarely clear about is if defeating monsters means destroying them. It seems like this is the case due to how everyone reacts and Lute always tells everyone not to defeat the monsters except for when he does. The show’s just really not consistent here. This may be more the dub than anything, but it really tried to never use the word destroy. As a result, “defeated” is the term always used even when a monster is slain. That’s why the middle arc gets really dark as Cheval goes around destroying all monsters who have been in contact with the blight and even any other that just gets in his way. Lute and the others are unable to save any of them. Chieval even commands a Nargacuga of his own as a revenge of sorts for the main one dealing with his family. He is very mean to it of course and then abandons it. Cheval never really had to answer for all of this much and I just felt bad for the monsters. Then of course we have the hunters running around slaying them all. It’s definitely a rather brutal world that Lute and the others live in. The worst part is that Lute has his kinship stone which can purify all of the blighted monsters but he typically forgets about this and still tries to take some of them down at times. This whole part of the saga definitely brings it down quite a bit and is one of the main reasons why the Black Rider arc ended up winning. At this point the monsters started getting written out a bit although Shadow still destroys quite a few along the way as well. I guess they all need to become pals with a main character quickly before it’s too late. Lute is your typical main character. He believes in the power of friendship (Known as Kinship here) and is always willing to lend a helping hand. He’s really close with Navirou so they trade insults quite a lot but all in good fun. Lute’s only real flaw at times is just how much of a pacifist he is. Even when being attacked he refuses to fight back if he is up against a fellow rider. This is at its worst during the final arc when he first fights with Gale. Considering that this guy kidnapped one of his friends and may destroy the village, Lute really has no time to keep trying to dodge the fight. You’ve got to make a stand and it’s not like simply fighting the opponent is the same as destroying him. Aside from that it is nice to have a more experienced Lute for the final arc. He is treated with a lot of respect at the end since he did help save the world and his new design does a good job of getting that across without any words. As soon as you see the design for the first time you can tell that he has gotten stronger. Navirou is Lute’s travel companion and he is very useful for navigation in his mind at least. He is the main comic relief character of the series so you can probably guess that he isn’t very good at almost anything. He does have some thunder abilities which are really handy when Navirou actually remembers that he has such a power. Unfortunately that isn’t very often so don’t expect to see it much. Navirou’s cross armed salute is probably his best running gag but I also don’t mind his “Navi rules.” Cutting out some of his comic relief would probably have been nice though or even some of the cat episodes in genera. Overall I think he worked well as a support character and I’m glad he was around but the character could have been better. Lilia is technically one of the 3 main characters for a while but starts to get written out by the end. Her path in the show was doomed from the start as she did t have a monster to protect her. Without a monstie in an action show like this, of course she wouldn’t ultimately stand a chance. It’s the same situation as being in a Pokémon show without catching a Pokémon. Lilia decided that she wanted to be a researcher instead which is fine but that kind of character rarely gets to do all that much. Lilia ends up being rather bland as a result. Then we have Cheval who is the main rival. He gets a very Sasuke esque role here as he starts out by being one of the more heroic characters, but quickly starts to let the darkness consume him. He goes as far as to try and destroy Lute multiple times and nearly destroys one of his own Monsties. His whole arc gets rather dark at times. Naturally he also gets the redemption arc at the end as well. It may be a little tough to buy into as well especially since he did claim quite a few victims. Lute may accept him, but should he? 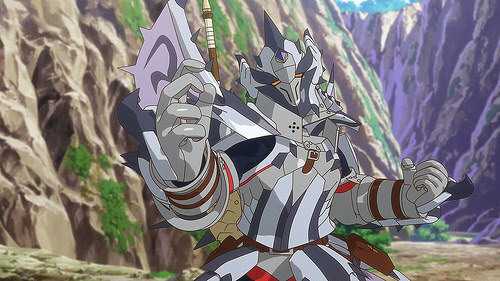 Ultimately it’s hard to see Cheval as anything but a villain even by the end. It’s a shame because his character type is always nice as he becomes the rival that he always should have been by the end. The guy certainly went through a lot of character changes. Avinia is a mysterious figure who shows up in the series from time to time before getting a big role in the final arc. She does lose this mystique almost right away but it was nice to finally have another rider who could fight. At the time Lute was the only heroic rider so he really needed an ally. Unfortunately, we never did get that Avinia vs Cheval fight I was hoping for. Once again I can say that the show dropped the ball with Avinia quite a bit. She has one of the best designs in the show and a monstie with a lot of potential. Despite this she rarely fights in the series and spends most of the final arc on the sidelines. Considering how powerful she apparently is, I would have liked to have seen her play a more active role. Still a cool character but one who wasn’t given enough to do in the show. Of course we can’t forget about Deb….Li. Every character in the series likes to mess up his name and it is heavily implied that this is intentional. That’s because they say his name normally when he isn’t around. We already have a handful of comic relief characters but I guess you can never have too many as this one was thrown in as well. For the most part he is about as obnoxious as you would expect. He yells quite a lot and can’t seem to do anything right. The one running gag that he does right (Aside from the whole name thing since that one is decent because of how Debli panics every time) is when he Rides on. The animation and fake sound effect that he gets for it is handled beautifully. Debli toes the line between being a sympathetic character and an annoying one and does a good job of making it ambiguous. In the end I was okay with him although I wouldn’t have been sad if he had never shown up. Reverto is probably one of her biggest unintentional jokes in the series. He gets a lot of hype throughout the series as being one of the world’s greatest hunters. If that really is the case then that doesn’t bode well for the hunters in general. He can barely handle any legitimately strong monsters and forget about taking down a plot important villain. In this show all hunters can do is swing their sword around and hope to land some good hits. They have no special abilities or even any enhanced physical ones. They are just guys with swords. Of course one of the main themes of the show is that the Riders are right and the Hunters are wrong so I wouldn’t expect them to look that good but they look downright horrible by the end. Hundreds of hunters can accomplish what a single rider can because they have no special abilities. Why would they possibly not want to become riders then? How have they not all been wiped out by this point? Anyway, there isn’t anything actually wrong with Reverto as he is a decent character but you just can’t take him seriously when he is fighting because despite all of the tough talk you know that he won’t end up coming out on top. He is just there to buy time for Lute. Simone would fall into the same issue except from the start she is portrayed as a researcher rather than a fighter. Her intel is rarely useful and barely goes beyond the realm of common knowledge but I guess her role isn’t all that bad. She’s just not a very interesting character and none of her scenes really leave an impact. Cut her out from the show entirely and nothing really changes at all. That’s never a good sign. Dan is one of those comic relief characters where you aren’t sure if it is intentional or not for a while. Technically you would think that he is rather skilled since he is rather old and teaches the kids, but they end up surpassing him very quickly. Part of the issue is the fact that he chose a very weak monster to be his monstie. He never explains why he doesn’t just pick a different creature. Perhaps it has sentimental value or perhaps he just isn’t the smartest rider in the group. Either way, his character doesn’t work too well and his “In top Form” battle cry is so half hearted that you will wonder why they built a whole character around the line. As you can tell, many of the supporting characters just aren’t very interesting. I won’t even get into the various elders who never do anything or the riddle master who is just annoying. Mille is one of the side characters who is actually good. She can fight and in the final arc is probably the strongest rider aside from the main 2. (Lute and Chevall) O would have liked her to have gotten more of a role though. From the start of the show you got the impression that she may turn out to be a bit of a rival or at the very least would remain as one of the main fighters for a while. Instead she is effectively kept to the background for most of the show. Still a good character but she could have been even better. Instead a lot of screen time is wasted on Hyoro as he tries to overcome his timid nature. The plot does not go well and he even sides with the villainous Chevall to take on the village. Yes, Mille does this as well but at least she was already a quality character. Hyoro never ends up becoming a good character and even after he gets stronger off screen for the final arc it’s hard to ever gain respect for the guy. He just never had a big moment where he got past his fears and did something amazing. Instead he essentially proved his doubts right as he never got to be all that strong. Genie is Hyoro’s older brother and the main reason why the kid turned out the way that he did. Genie can be overly critical of Hyoro but of course he says it is only to make Hyoro better. I didn’t mind Genie, but he was a rather half hearted bully who couldn’t back up his tough talk. Ultimately he was about as weak as the other side characters and Hyoro likely surpassed him in the end. 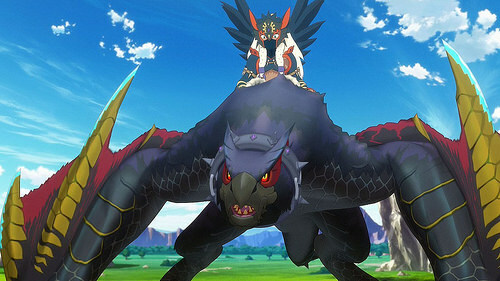 Gale is the Shadow Rider with the biggest role in the series. He gets to fight Lute quite a few times and his skills are the real deal. He is also the strongest member I’d say although Shadow would give him some competition for that title. He gets quite a few plot twists. While his plan may not have been amazing and he probably should have tried doing something a little earlier, he did make for a good rival. He just kept getting stuck in rather bad situations. While he was also unable to make the hero move at the end which nearly caught him, it’s a mistake that I could sympathize with since he was so close to finally accomplishing his goal. It was an intense moment and he’s in my top 3 characters in the series. I’d say that he is second only to Lute. Next is Shadow who is certainly the 2nd coolest member of the group. Her speed is astounding to the point where the heroes can’t even keep track of where she is. There is a plot twist about this that I was a little mixed on. It is essentially a nerf, but I didn’t see it coming so I’ll give the show that. I also think Shadow’s rage mode should have kicked in instantly after what Anvis ends up doing to someone instead of waiting til their next meeting. It’s not as if anything would have changed in the outcome though. Then we have Mad who is one of the villains that you can’t take seriously. I guess in the end the Riders could only score a 50 as 2 of their members were good and the others weren’t. Mad is just one of those guys who only cares about his looks and as a result he can be defeated if you simply get some dirt on him. Even his monster’s design isn’t all that good. It’s basically just a huge worm so that’s not too impressive. Same goes for Wrath but to an even bigger extent. Wrath is the strong but not smart type, but he isn’t even all that tough. There’s nothing original or interesting about him as a character. Finally we have Anvis, the leader of these guys. Somehow he was able to gain control over an Elder Dragon even before undergoing the complete power up ceremony. Considering this, he does earn the title of being the strongest rider in existence. He makes for a solid final boss and a solid character all around. He definitely thought things through and stayed one step ahead of Gale and the heroes for a while. He’s a considerable improvement over the doctor who was the main villain of the first few arcs. He is reduced to comic relief for the final arc and was never much of a threat anyway. His episodes had a tendency to simply be rather boring so I was fine with him being gone. There are also the Numbers, but they never had much of a point in the story. They are really just around to get their long piece of recycled animation over and over again. The show certainly loved doing that to save on the budget. The animation for the show is fairly decent. It does take a lot of shortcuts by using recycled animation constantly though. This becomes a bigger issue in season 2 as we even get little scenes of the characters reaching out when calling their monsties. It feels really forced and I could have done without that. I’m happy they all got armor but it just feels like another way to save on animation. It also uses quite a bit of CGI. We do get some real animation whenever a big fight happens though. Some of the special abilities also look really good like Chevall’s energy disc. Overall, the animation wouldn’t hurt the show, but it wouldn’t really help it either. The soundtrack is rather bland as well unfortunately. You will definitely start to remember the tunes after a while since they keep on popping up, but that’s because the soundtrack is just really limited. I would have loved to have had some really great tunes to amp up the fight scenes, but alas it was simply not to be. This title could not deliver. Finally I have to say that the show’s ride on mechanic seems rather odd. Basically the monstie that is summoned shows up when a character strikes the pose. The show portrays this as the monsters are just hiding nearby until they are needed but what are they doing in the meantime? Shouldn’t they just be with the heroes then? Lute has over 6 monsties in the show, but only uses his main one for basically the whole series. What is even the point of everyone having up to 6 if they only use one for all of the fights? They should have just had Pokeballs of some kind to keep the others in as that would make more sense if you ask me. I think the show dropped the ball a little on the collect them all aspect of the series. Overall, This isn’t a bad show. I’d say that Monster Hunter is fairly decent. The problem is that it’s only average or below average in most areas. There isn’t a single section that I could point to and say that the series was amazing. On the contrary, the series could be a little boring at times. The characters just aren’t strong enough to hold the show as well as others could. It got a little more exciting towards the end but the show also amped up the crude humor and comedy to match. I’d recommend checking it out at some point if you need a good fantasy show, but there are many others that I would suggest seeing before this one. At least there is a lot of content here since the show managed to make it to around 70 episodes. That was actually pretty impressive.